Sterling silver Celtic charm is cast in sterling silver that is enhanced with green enamel shamrocks along with blue enamel Trinity knots. This sterling silver Celtic charm has been hallmarked by the Irish Assay Office at Dublin Castle in Ireland. 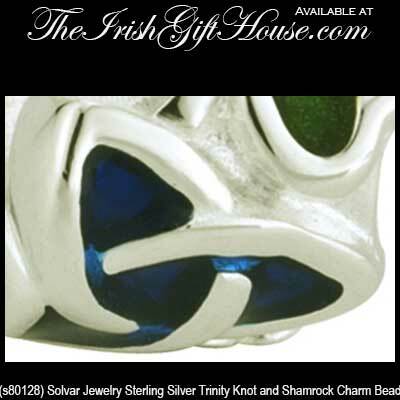 This sterling silverCeltic charm features green enamel shamrocks along with blue enamel Trinity knots. The Irish bead measures 3/8" wide and fits all competing charm bracelets. 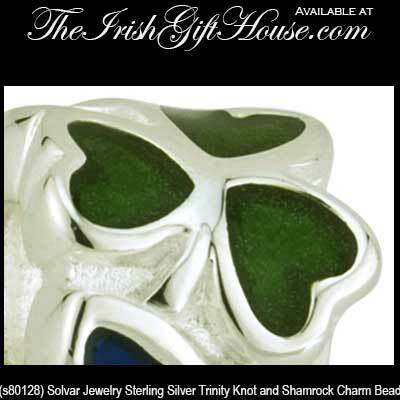 The Trinity bead is made by Solvar Jewelry in Dublin, Ireland and it is gift boxed with Celtic knot and shamrock history cards, complements of The Irish Gift House. Celtic charm features sterling silver construction that is enhanced with shamrocks along with Trinity knots and spirals. 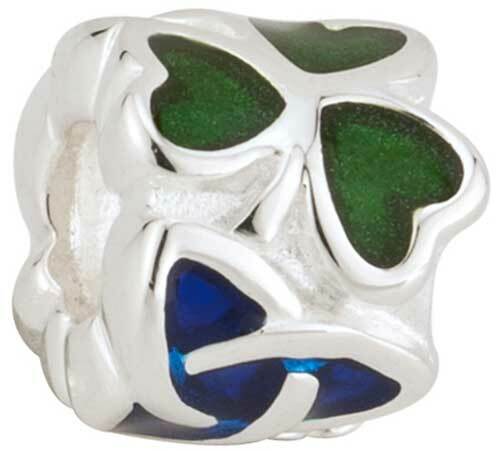 Shamrock bead is a sterling silver design that is accented with green enamel inlay.